This morning kept me on my toes, but I'm back at my desk and ready to blog! I hope you are having a great afternoon, staying cool, and ready for some design inspiration and eye candy because I'll be back with some fresh finds in just a few moments. I'll start with something design-y, only this is more for wearing than displaying over a mantle. If you are on the hunt for fun tees (who isn't), or several hundred fun tees, Threadless is your place. 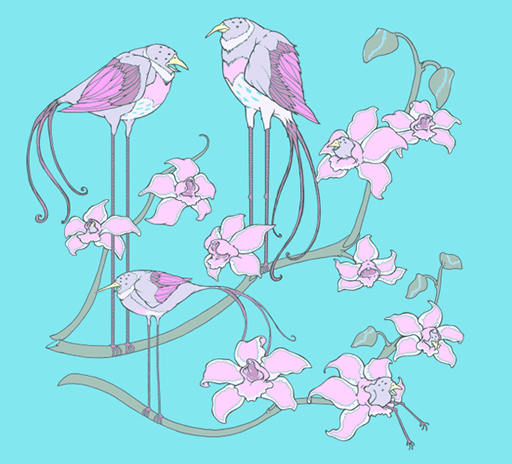 The above image is from a new design, "Strange Birds" from John Mitchell (tee design king). It's available for guys (are you man enough for aqua and pink?) and girls, $25. Dwell Baby Softies - Blocks + Animals!